Mr. Archer! You made us work hard for your birth, Buddy! This midwife was just about out of tricks when you finally arrived. Regardless of what I was thinking, Archer’s mama never ever gave up! I’ve honestly not seen a woman work so hard for so long to get her baby here. She did everything we asked her to, never once complained, always persevering throughout the entire process. And her husband too. He was the best support person for her. No one else was able to give her the relief and guidance quite like he did. Once Archer began to make his arrival, he got a little stuck. We had to do a few maneuvers to get him the rest of the way out, but out he came. He was a bit stunned from all the wrangling but after a couple of puffs of air from the bag and mask, he let me know exactly what he thought about “all that!” He definitely had something to say!! 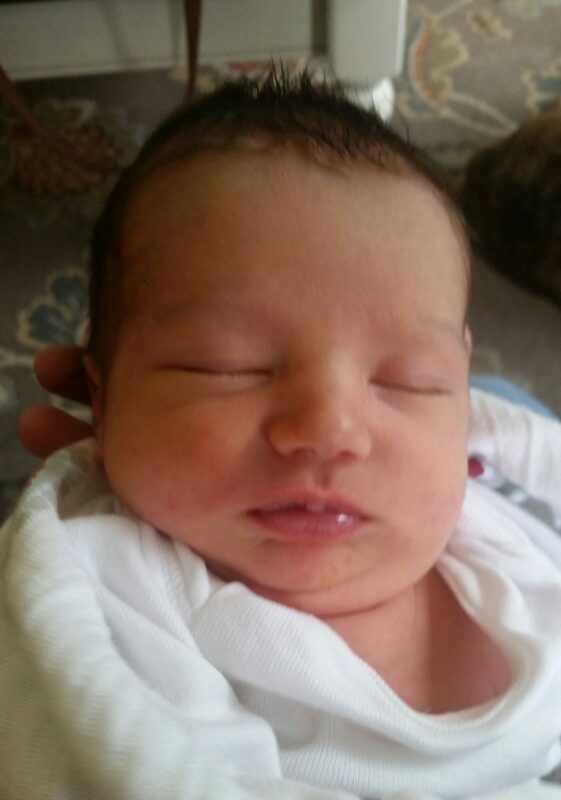 Archer shocked his parents & grandparents when they weighed him in at 9lbs 11 oz and measured 21.5 inches tall. He is his parents second son and their 1st HazelTree Baby! 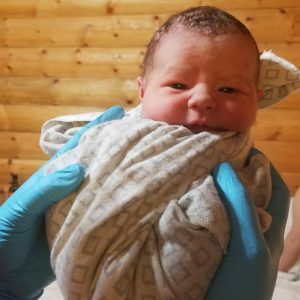 Penelope was born June 5, 2017 at 12:48 a.m. in the birth pool that wa set up in her parents guest room. Her mother labored fearlessly, never giving up, ever surrendering to the process, regardless of how long it took. And it took a while. Once Penelope was born, she needed a bit of assistance to initiate her first breath but after that, she had a story to tell. And tell it she did! Loudly and with vigor! 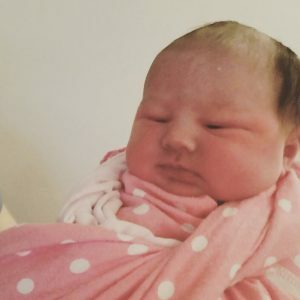 Penelope weighed 9 lbs 13 oz. and measured 22 inches tall. She is her parents 6th child and their 2nd HazelTree Baby. Look at those glorious cheeks!!! Sophia and her big sister Natalia, who is also a HazelTree Baby! 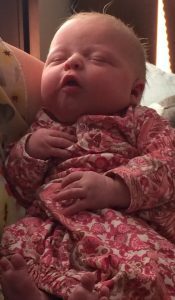 Miss Sophia made her debut appearance on June 2, 2017 at 11:10 p.m., welcomed by her mother, grandmother and two oldest siblings (her 2.5 yr. old. sister was sound asleep in her bed.) Daddy was out of town working, but he was on speaker phone the entire time. It was such a treat watching the older siblings offer support and encouragement to their mama during her labor. 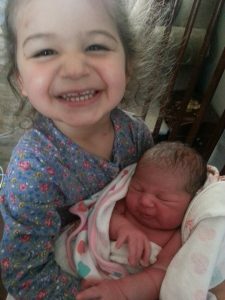 After Sophia was born, her big brother helped to “make her belly button” and big sister put her first diaper on. Miss Sophia is her parents 4th child, 3rd daughter and 2nd HazelTree Baby. She weighed 7 lbs 10 oz and measured 19.75 inches tall. Once again, we were reminded that you cannot put a time clock on birth! As birth workers you MUST stay open minded, fluid and flexible. Little Theo’s birth is an example of that. Typically 1st time mama’s go over due. I believe the national average is 10 days passed the estimated due date. And generally, that’s true. Also, typically first time mom’s will labor for a good amount of time and likely have to push for a bit as well. But not Theo’s mom!!! Holy Cow! This woman!! She labored beautifully throughout the day…the normal early labor stuff. But when it kicked into gear, WOW! It kicked into high gear. She went from 4 cm to complete in record time. 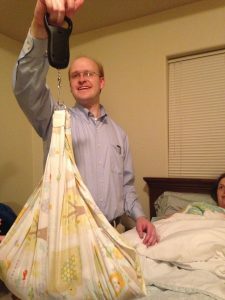 In fact, her birth team arrived 30 minutes before she birthed her beautiful son in the birth pool that was set up in their living room. IT WAS AMAZING!!!! Theo was born June 1st, 2017 at 10:02 p.m. He weighed 6 lbs 1 oz and measured 19.5 inches long. He knew just what to do as soon as he was born, latching on for a late night snack right away! To watch his parents interacting with him, you’d never know that this was their first child. They are already pros at this parenting gig! Miss Lucy was born in her parents bedroom on June 1st, 2017. She sure took her sweet merry time getting here! 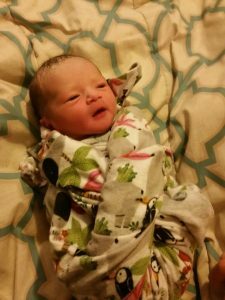 Her parents and birth team were a bit perplexed as to why she was taking so long, but alas…birth has it’s own time clock and we are wise to remember that. Lucy knew when she should be born, right down to the exact minute. These babies…they are the wise ones!! Lucy’s mother exhibited true warrior woman tendencies during this long, arduous labor. When Little Miss’ arrival was finally imminent, Mama instinctively knew that she needed to be on her hands and knees to deliver. As Lucy emerged, Krysta passed her slippery body between her mother’s legs so that Mama could grab her baby and hold her tightly to her chest. It was all that she wanted! Her baby was here. She was finally HERE, safe, sound and loudly beautiful! Lucy weighed 9lbs 9 oz and measured 20.5 inches tall. She is her parents 5th child, and their 1st HazelTree Baby. We are all very smitten with her! Cruz was born May 28, 2017 at 5:04 p.m. in his parents luxuriously large bathtub. It was a magical day! The sun was beaming in through the full length windows, there was soothing essential oils misting throughout the room and family members were in and out of the birth space offering love and encouragement. Oh! And let’s not forget the delicious food cooking in the kitchen, the aroma wafting throughout the house. This family! They made us feel a part of their tribe so effortlessly. We padded about in bare feet, visited with out of town family members, played a bit with Big Brother, all while continually & quietly observing, monitoring and staying out of the way so that this mom & dad could do the most beautiful of labor dances. They labored in the tub together, Dad supporting Mom the entire time. It was Dad’s desire to catch his son and he was the most hands-on father I’ve met. He intuitively supported his wife in all the ways she needed. When she reached that primal urge to push, he was there supporting her, helping her, and readying himself to catch his boy! He needed very little guidance from me. Just a word or two of encouragement, a bit of direction and he was on point! As Cruz made his entrance, born into his father’s gentle hands, Daddy effortlessly lifted him out of the water and placed him on Mama’s chest. It was one of those moments that I pray I never forget! The look of pure adoration on Dad’s face; the absolute unconditional love literally exuding from Mama for her new son…those are the moments that I live for. I can’t believe I am so blessed as to be a witness to such beauty. My heart was so full of love for these two, I thought I’d burst. Cruz is his parents 2nd son and their 1st HazelTree Baby. He weighed 7 lbs 13 oz. and measured 21″ tall. Kaeden was born May 13, 2017 at 11:36 a.m. His mama is one of those rare women who literally have pain free labors and births. It’s quite incredible to observe. When we arrived at her home she was already 8 cm dilated. 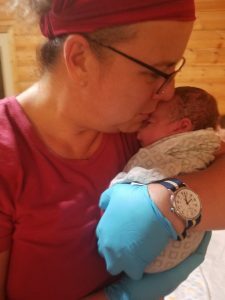 She had planned a birth center birth at Dayspring Midwifery, but we quickly changed gears and began to prepare her home for Kaeden’s imminent arrival. While family members made mad dashes to Walmart, put older children down for naps and finished up last minute details, Kaeden’s mom silently labored. We had a very hard time telling when she was contracting, she was so peaceful and introspective. At one point she said, “Oh! I think I might need to push soon.” That’s about all we heard until Krysta was getting the shower water temperature just right for her. Then suddenly I heard, “Uh…Guys. He’s coming! His head….” Krysta turned the shower off, turned around and caught Mr. Kaeden as his stunned mama looked on. Seriously! That’s all there was to it. 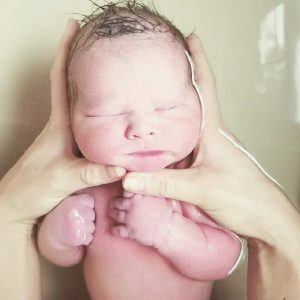 She was just getting ready to get into the shower and BOOM…baby born while she stood on the shower mat. INCREDIBLE!!! Kaeden is his parents’ 3rd son and their 2nd HazelTree Baby. Isn’t he gorgeous? Sometimes birth doesn’t go the way you plan it. That is the way it was for Leo’s parents. They were in Moscow that day, April 16, 2017, visiting family members and preparing to celebrate Easter. Leo’s mama started having contractions in the wee morning hours and before any of us knew it, she was having them 2-3 min apart!! 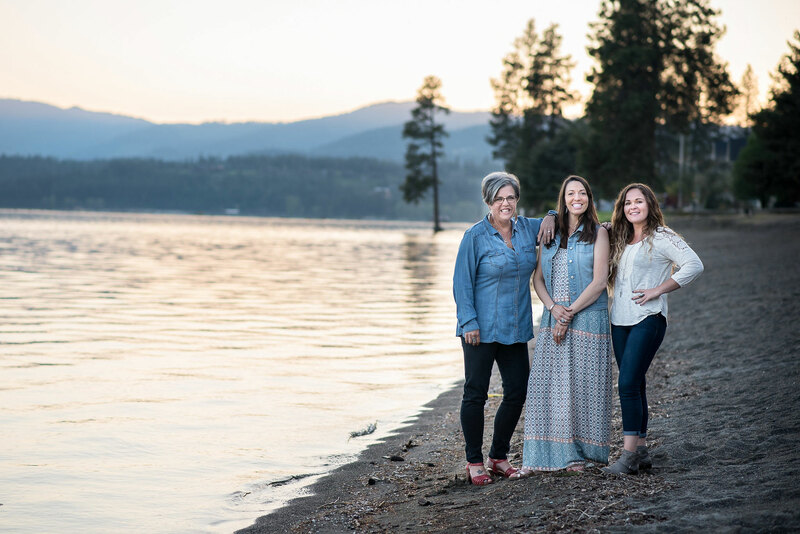 There was no way she was going to make it back to Coeur d’Alene to have her home birth, so they detoured to the local hospital. Though this wasn’t the plan for Leo’s birth, he obviously had other ideas. He was born at 8:18 a.m. He weighed 7 lbs 4 oz and measured 20 inches tall. We couldn’t wait for them to get home so we could meet this beautiful, determined young man. Just look at those perfect little lips!! And that hair!!! Oh my heart!! Leo is his parents 3rd child, 2nd son and 1st HazelTree Baby!! 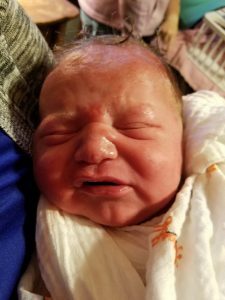 Miss Evelyn was born 4/13/2017 at 5:39 a.m. I was out of town when she was born but Midwives Extraordinaire, Krysta & Jenn were there to help. They both informed me that Evelyn’s mother could have starred in the new movie Wonder Woman! That’s how great of a job she did bringing Evelyn into this world!! Evelyn was born in a birth pool in her parents home. She weighed 9 lbs 15 oz. and was 20 inches tall. She is her parents 2nd daughter and 1st HazelTree Baby. Just look at those cheeks!!! Miss Olive was born April 8, 2017 in her parents’ bedroom. The day was gorgeous, still a bit of snow in shady places, the home surrounded by N. Idaho forest, chickens scratching in the yard, sunshine coming through the windows. Olive’s big sister and grandmother were busy throughout the day, reading stories, baking and doing all the things big girls like to do with their grandmas. This allowed Olive’s mom and dad to labor together throughout the day, which they did beautifully. Olive’s mama labored so amazingly. She exhibited such strength and resiliance. She birthed Olive in her bed without complications. Olive weighed 6 lbs 1 oz and measured 19.25 inches tall. She is her parents 2nd daughter and 1st HazelTree baby. And as a side note: While Miss Olive was preparing to make her entrance, my own daughter was laboring as well….thousands of miles away on the other side of the continent, preparing to give birth to my 3rd grandchild. 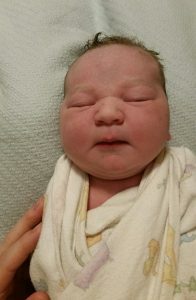 Olive was born 30 minutes ahead of my grand-girl Emelia. They weighed & measured just about the same too. The similarities in their births are uncanny and will always and forever keep Olive in a special place in my heart! !